Whether you are a proud new parent looking out for your new baby or keen to provide for your family down the line, life insurance is a cornerstone of a sound financial plan. Not only can life insurance replace income for dependents, pay final expenses, and cover taxes, but it can also create an inheritance for your heirs. If there is one insurance policy not to overlook, it is life insurance. Policygenius provides a comparison shopping portal for you to find top-rated life insurance companies. 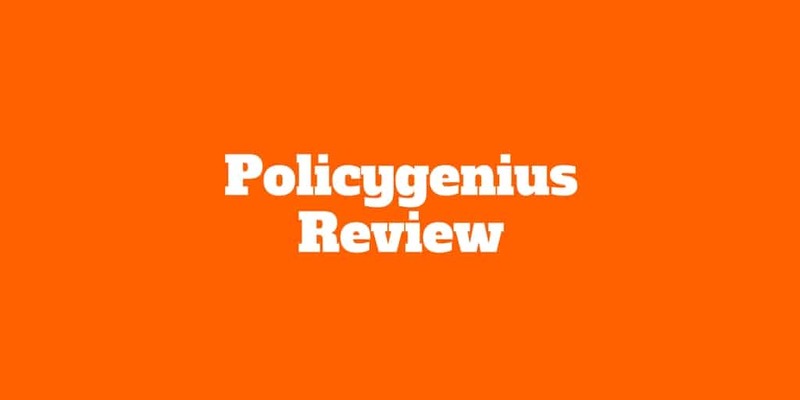 It is no surprise that Policygenius earns rave reviews from customers because it only works with insurers who have been awarded high financial ratings, removes pushy agents from the sales process, and allows you to compare and shop 100% online. No matter what kind of life insurance best meets your needs, you can compare quotes easily. Best of all, Policygenius is 100% free so it doesn’t cost you a penny to compare life insurance options. But what else do you need to know before shopping for life insurance at Policygenius? What Types Of Insurance Does Policygenius Provide? Is Policygenius Right For You? Who Is The Team Behind Policygenius? Extra, Extra! Who Are Policygenius Partners? What makes Policygenius different from other insurance sites? If it’s free to get quotes, how does Policygenius make money? Is Policygenius an insurance agent or broker? Can you buy life insurance for less through Policygenius? It’s easy to feel bamboozled by life insurance options, so how do you find the best life insurance policy to meet your needs? The most common types of life insurance are term life insurance and whole life insurance. Term life insurance can generally be converted to whole life insurance. Whole life insurance includes lifetime coverage and you typically need a medical examination to qualify. Whether you are looking for term life insurance, whole life insurance, or other types of life insurance, Policygenius is a top notch comparison portal designed to vastly simplify the insurance-buying process. Policygenius helps people to get the insurance coverage they need and make them feel good about it. And to make that happen, the first step is to provide you with unbiased advice that is jargon-free. Next, compare quotes side-by-side to find the best option and save money. And lastly you can apply and buy life insurance through Policygenius, and leave it to their licensed advisors to handle the details free of charge. Policygenius is your portal to just about any type of insurance you may wish. Although life insurance is its flagship product, you can find other types of insurance from disability insurance to auto insurance there too. If you don’t know exactly what type of life insurance you want or need, Policygenius has an extensive library of articles to help you become more informed. Should you buy life insurance for children? Policygenius then goes a step further and reviews companies with which it is affiliated so you get a better perspective on your options. For example, if you are looking for renters insurance, Policygenius features reviews on Allstate, Lemonade, Geico, Progressive, State Farm, Stillwater, and Liberty Mutual. Once you are clear about what you want, it is simple to get free quotes. Simply enter some personal information about where you live if you are looking for renters insurance, jot down what stuff you own, and the level of the protection you need, and then checkout. Similarly, if you were looking for life insurance, you would submit your details, enter your health details, and get free quotes in no time. It’s as simple and intuitive as it gets, which is one of the reasons Trustpilot reviews of Policygenius are about as close to perfection as possible, almost a perfect 10. If you are looking to provide for your family, Policygenius is a one-stop portal to compare life insurance policies. Policygenius connects you to insurance coverage from its partners who have financial ratings of A- or higher. And to give you further peace of mind, Policygenius is licensed in all 50 states. Since inception, Policygenius claims to have helped over 4.5 million people shop for insurance and protected customers with over $20 billion in coverage. And it earns an A+ rating from the Better Business Bureau, so it has done an excellent job overall in serving customers and successfully resolving disputes and complaints. ✅ Intuitive Portal: Every step of the insurance comparison and buying process is made simple. The widgets to walk you through getting quotes are polished and intuitive. ❌ Limited Number of Insurance Partners: Because only top rated insurance companies who already partner with Policygenius are featured, you may wish to shop around online to see what other insurance options are available. ✅ Many Types Of Insurance: You can find health, auto, life, disability, renters, pet, jewelry, homeowners, travel, and identity theft insurance quotes. ❌ High Risk Users: Individuals with impaired risk may need to speak with experienced agents to help find the right insurance options. 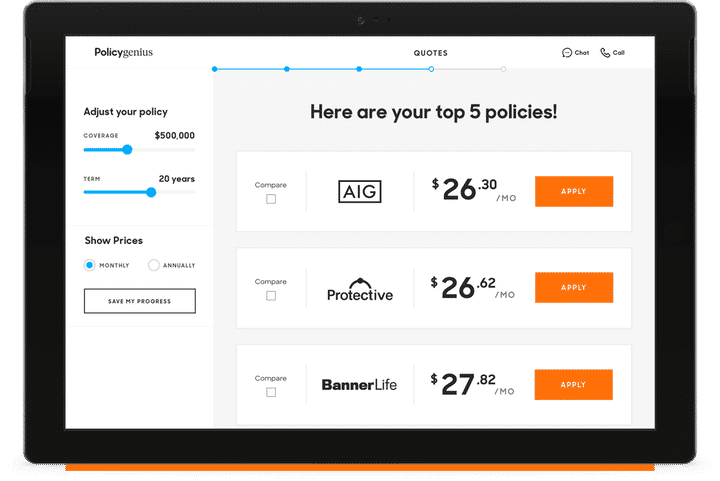 ✅ Free Quotes: Policygenius makes it easy and free to compare quotes from top insurance companies. ✅ Extensive Knowledge Base: You can learn more about any type of insurance coverage featured by Policygenius in its extensively library of articles and resources. ✅ High Rated Partners: Policygenius only partners with insurance companies who have financial ratings of A- or above. ✅ National Coverage: Users in all 50 states can shop for insurance coverage with Policygenius. ✅ 100% Online: The entire process of comparing and buying insurance can be done entirely online so you can avoid high pressure insurance sales agents. ✅ Extraordinary Ratings: Policygenius earns a near perfect 10 score on TrustPilot and an A+ rating from the Better Business Bureau. If the idea of calling a life insurance sales agent who may pressure you into purchasing an insurance policy you don’t fully understand gives you the heebie-jeebies, Policygenius is a 100% online comparison engine to help you find life insurance policy to best meet your needs. It’s 100% free to get quotes so you don’t have to worry about hidden fees being tacked on after you choose a policy. Whether you are looking for life insurance, health insurance, disability insurance, or a range of other types from auto insurance to pet insurance, Policygenius connects you only to insurance companies that have been awarded high financial ratings. From start to finish, it is easy to compare and buy insurance. The process is simple, fast and the user experience is friendly and intuitive. Policygenius got its start in 2014 when its founders, Jennifer Fitzgerald and Francois de Lame, realized that buying insurance is a painful process for consumers who are often made uncomfortable by pushy sales agents. Even when people buy insurance, they often wonder whether they are on the hook for something they might have missed in the small print of their insurance policies. Spotting these problems, Fitzgerald and de Lame were inspired to create a better way to shop for insurance and Policygenius was born. Policygenius partners include the best known insurance brands in the United States. And all of them have earned financial ratings of A- or higher to qualify as partners on the Policygenius platform. Insurance sales agents can be pushy, which makes for an uncomfortables shopping experience. At Policygenius, you can compare and shop 100% online. The sales agents employed by Policygenius are available if you have questions. They are salaried not commissioned, so they don’t make more when you buy. That makes for a more enjoyable experience when comparing insurance options. When you buy an insurance policy, Policygenius earns a commission. However, it is baked into the price of the policy you are quoted, so you don’t pay additional fees beyond the price quoted to you. Yes it is licensed in all 50 states and Washington D.C.
Policygenius is an independent insurance broker that is unaffiliated with any insurance companies. Because Policygenius represents many insurance companies, it claims to have no bias towards any individual company. You can save money by comparing insurance policies of different insurance companies. Because insurers compete to win your business, they offer the best prices on their best products. However, you cannot get a cheaper price for a given life insurance policy from a particular insurance company through Policygenius, or from another broker or even directly from the specific insurance company. The reason for this is that each insurance company is required by law to file prices with state regulators and everyone has to abide by them; it is illegal to discount prices below those price levels.